The modern Aston Martin V8 Vantage is a compact sports car. Aston Martin previously used the "Vantage" name on its highest-performance vehicles, and notably used the "V8 Vantage" name on their supercar of the 1970s and 1980s. The modern car, in contrast, is the lowest line in Aston's 3-model lineup, and is intended as an affordable volume model to compete with the Porsche 911. 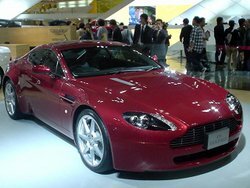 The V8 Vantage was first seen at the Geneva Motor Show in 2005. The two seat, two door coupe has a bonded aluminium structure for strength and lightness. The 4.38 m (14.4 ft)-long coupe has a hatchback-style tailgate for practicality, with a large luggage shelf behind the seats. Note that Aston Martin invented the hatchback body style with the 1953 DB2/4. The V8 Vantage is powered by a 4.3 L (4280 cc) quad-cam 32-valve V8 which produces 380 hp (283 kW) at 7000 rpm and 302 ft·lbf (409 N·m) at 5000 rpm. This engine is unique to Aston Martin and features race-style dry-sump lubrication, which enables it to be mounted low to lower the centre of gravity. The engine, based on the Jaguar AJ-V8 engine, is assembled by hand at the AM facility in Cologne, Germany, which also builds the V12 for the DB9 and Vanquish. The cylinder block, cylinder heads, crankshaft, connecting rods, pistons, camshafts, inlet and exhaust manifolds, lubrication system and engine management are all unique to the Aston Martin version. The V8 Vantage can accelerate to 60 mph (97 km/h) in 4.9 seconds. The V8 Vantage is able to keep up with its more powerful relative, the Aston Martin DB9, because of its lighter weight. The engine is front mid-mounted with a rear-mounted transaxle, giving a 49:51 front:rear weight distribution. The V8 Vantage will cost £79,000 or €104,000 when it goes on sale towards the end of summer 2005. Aston Martin plans to build as many as 4,000 V8 Vantages per year.